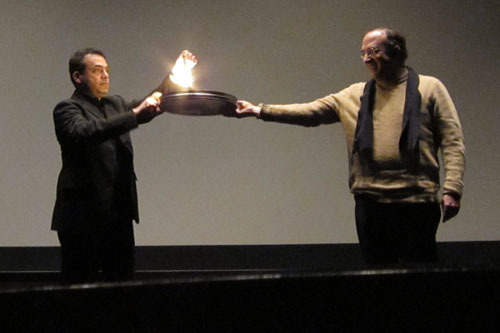 What he saves films from: Serge Bromberg faces down the flames. We’re ending the first week of three in Paris. At the invitation of Jean-Loup Bourget and Françoise Zamour, David is giving three weekly lectures at the École Normale Superieure. He’s introducing some ideas about the development of film style in the 1910s and early 1920s, updated with new material from his summer research in Denmark and Brussels. Jean-Loup and Françoise have proven excellent hosts, and the first lecture seemed to go well. We thought that Paris in January might be chilly and rainy, but we figured it had to be warmer than Madison. It turned out that Paris is experiencing unusually cold weather—about what would be normal in Wisconsin. There was light snow yesterday and last night, and the wind-chill factor was enough to turn our fingers numb if we stayed out long enough. 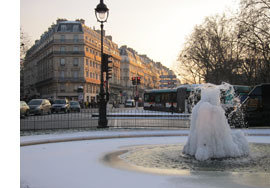 The fountain in the center of the intersection at the northeast corner of the Jardin de Luxembourg has gradually become an iceberg. Turns out, though, that it is still warmer than Madison, which is having highs in the single digits, as the weather forecasters say, and lows below zero. We’re better off here, though we wish we had brought our parkas. The cold has driven us indoors, to museums and movies. As always seems to be the case, the Cinémathèque Française is hosting retrospectives of American films—in this case works by Laurel and Hardy and Gordon Douglas. There’s also a 3D series, which caught our attention right away. It’s not just your standard Kiss Me Kate and Dial M for Murder programming. In addition to such classics, there are many obscure films. We happened to arrive in time for the final two programs of the series, which ran from December 16 to January 3. Our first full day in Paris ended with an evening of shorts presented by Serge Bromberg, who in 1985 founded Lobster Films. Lobster has put out many DVDs by now, some of which we have reported on previously, here and here. In July, one of our entries on Il Cinema Ritrovato in Bologna mentioned that Serge presented a program of Georges Méliès films, in conjunction with the French release of Lobster’s huge DVD set of the great magician’s films. Serge is quite a showman and obviously a popular figure, since there was a large crowd, including many families with children. On Saturday he chose and introduced a set of short 3D films in his series of programs usually titled “Retour de Flamme,” or “Saved from the Flames.” To begin the evening’s entertainment, he explained how, unlike modern celluloid 35mm film, the nitrate variety used up until the early 1950s ignites and burns easily. With the help of a rightly apprehensive volunteer holding up a film-can lid, Serge showed how modern celluloid catches fire only briefly and then dies out. The few inches of nitrate, however, flared up quickly. Serge introduced each film thereafter, playing the piano to accompany the silents. The audience had been given both anaglyph (red-green) and polarized glasses, and Serge’s introductions to the films gave us time to switch between systems. Many of the shorts shown on the program are available on DVD or YouTube, but the 3D effect plays best on the big screen. The evening began with an unannounced item, Three Dimensional Murder, a “Metroskopics” comedy short from 1942. A nervous detective visits a mysterious house and encounters Frankenstein, creeping hands, skeletons, and other ghouls and beasties, all of which find some occasion to throw things or hurl themselves toward the camera. The humor is, as a contemporary audience member might have said, pure corn and the 3D effects repetitive, but it was certainly a rare item. Next came one of the Fleischer brothers’ cartoon shorts, Musical Memories. It was made with a patented system that used three-dimensional models as settings against which 2D cartoon figures drawn on cels moved about. (Such models can be seen fairly often in Popeye and other Fleischer cartoons of the 1930s.) There is some sense of depth. Still, the effect is strange, since the models have shading and the flat-looking figures do not. The cartoons are not 3D in the sense we typically think of, since there are no glasses involved. More cartoons followed, from the two main competing animation studios. Disney’s contribution was Working for Peanuts, a story set in a zoo with Chip and Dale stealing peanuts from an elephant and Donald Duck trying to foil them. Many a peanut seemed to fly out toward the spectator. 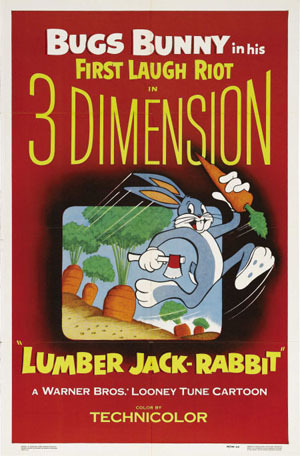 Chuck Jones directed Lumber Jack-Rabbit (1954), a film that mixed size gags and spatial ones, with Bugs wandering into the domain of the gigantic Paul Bunyan. Perhaps not one of Jones’s best, but distinctly more interesting in 3D. As Serge pointed out, most 3D technology was pioneered in the U.S. He included some exceptions, however, with a series of Soviet “Parade of Attractions” shorts shown at intervals during the evening. Experiments with underwater 3D photography and a garden of plants lacked soundtracks, but the final item, a vaudeville act with jugglers, had music and lots of bowling pins flying at the camera. Unbelievably, there were efforts toward 3D as early as 1900. Serge showed some 3D experiments from that period by inventor Rene Bunzli. These were only about 10 seconds long and included a mildly risqué scene of a man arriving to visit his mistress and another discovering his wife in bed with her lover. The first color 3D film was shown: Motor Rhythm, made by Charley Bowers in 1940 for the Chicago Exposition and distributed by RKO. Using a combination of pixilation and 3D, the film shows a car jauntily assembling itself to a musical accompaniment, with many of the parts moving out toward the camera before attaching themselves in their proper places. The National Film Board of Canada contributed Munro Ferguson’s Falling in Love Again, with characters wafted into the sky by road accidents and, while falling, falling in love. To watch it in high-quality 3D, go here. Pixar was represented by John Lasseter and Eben Ostby’s early digital experiment in 3D, Knick Knack, as a snowman trapped in a snow globe tries to break free to join a bathing beauty. The evening ended with a surprise, two films that had never been meant to appear in 3D. Méliès’s early shorts were often pirated abroad, and a lot of money was being lost in the American market in particular. After the Lubin company flooded that market with bootleg copies of a 1902 film, Méliès struck back by opening his own American distribution office. Separate negatives for the domestic and foreign markets were made by the simple expedient of placing two cameras side by side. The folks at Lobster realized that those cameras’ lenses happened to be about the same distance apart as 3D camera lenses. By taking prints from the two separate versions of a film, today’s restorers could create a simulated 3D copy! Two 1903 titles–I think that they were The Infernal Cauldron and The Oracle of Delphi–triumphantly showed that the experiment worked. Oracle survived in both French and American copies, and the effect of 3D was delightful. For Cauldron only the second half of the American print has been preserved. Watching the film through red-and-green glasses, you initially saw nothing in your right eye, while the left one saw the image in 2D. Abruptly, though, the second print materialized, and the depth effect kicked in. The films as synchronized by Lobster looked exactly as if Méliès had designed them for 3D. William Cameron Menzies is most famous as an art director on films like The Thief of Baghdad (1924) and Gone with the Wind. He was one of the most visually daring artists to work in classic Hollywood; his eccentric framings and looming foregrounds may have influenced Orson Welles. (The Gothic distortions of Our Town and Kings Row are unlikely to be the creation of director Sam Wood.) Menzies also directed a few films, most notably the slightly nutty anti-Commie film The Whip Hand (1951). 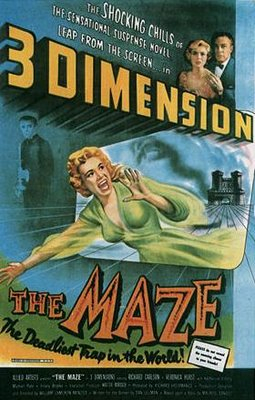 So Kristin and I had to go back to the Cinémathèque for Menzies’ rarely-seen 3D feature The Maze (1953). Alas, it was a washout. The feeble story concerns an heir returning to a castle to confront a giant frog, who may be his relative. I’d expected bravura deep-focus, with planes jutting out at me, but the film was dramatically and visually flat–no wordplay intended. The trailer, complete with fake bats on strings, is here. We have other incidents to chronicle, but this dispatch can end with a quick list of some of the film friends we’ve encountered. We’ve already mentioned Professor Bourget, whose book on Fritz Lang came out recently (below left). We also ran into Cindi Rowell, an old friend from Pordenone and The Griffith Project, who had the excellent idea that we go to Chinatown–here hidden behind the facades of tower blocks. Cindi has vast experience in many aspects of film culture–preservation, programming, publication, web design, and the like–and is currently affiliated with the Middle East International Film Festival in Abu Dhabi. Another old friend, Yuri Tsivian, is in Paris teaching during our visit, so we had a chance for a good dinner and lots of talk about editing in the 1910s. 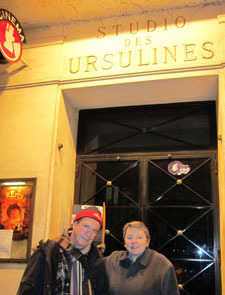 Below, he and Kristin pay homage to one of the shrines of Parisian cinephilia, the Studio des Ursulines movie theatre. 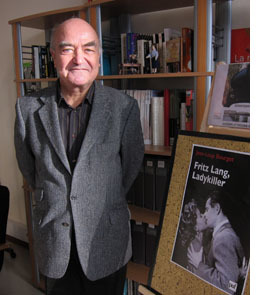 Left: Jean-Loup Bourget and his new book on Lang. Right: Yuri and Kristin at the Urselines. Last night, with Kristin away in Berlin, I went to a dinner hosted by Jacques Aumont and Lyang Kim. Jacques is a major film theorist, whose many books and essays probe into the artistic qualities of cinema. His book on Eisenstein is available in English translation, as is his far-ranging study of the history and functions of images. Lyang is an outstanding photographer, whose book of haunting Christmas images Dans l’ombre de noël was just published in December. Among her pictures here are some gorgeous “fusion” images that recall our recent 3D experiences. Then who should turn up but Marc Vernet and Rick Altman? It was an Iowa-Wisconsin reunion in the 10th. Marc is an expert on film noir, on cinematic images of absence, and on the American film company Triangle–associated with both Griffith and Ince. (Again, the 1910s.) Marc has set up a beautiful webpage full of information about early American cinema, and he blogs there frequently. Rick is known for his in-depth studies of film genre (especially the musical), film sound, and narrative theory. His most recent books, Silent Film Sound and A Theory of Narrative, are splendid contributions. Below, all four toast what turned out to be Rick’s birthday. Today: More preparations for my lecture tomorrow, and of course at least one movie. Agora? Wiseman’s La Danse? Kinatay? The new Eugène Green, La religieuse portugaise? Or a rerelease (new print) of Minnelli’s Four Horsemen of the Apocalypse? Or….? The usual Parisian problem, but a good problem to have. P. S. March 2010: After this Paris trip, I wrote an essay on William Cameron Menzies for this site. Jacques Aumont, Lyang Kim, Rick Altman, and Marc Vernet, 9 January 2010. This entry was posted on Sunday | January 10, 2010 at 5:25 am	and is filed under 3D, Animation, Directors: Menzies, Film archives, Film scholarship, Film technique, National cinemas: France, People we like. Responses are currently closed, but you can trackback from your own site.